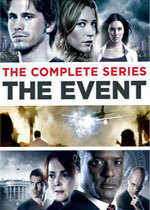 The Event: Mystery and Suspense on Television. The series, which premiered on NBC in Fall 2010, also stars Blair Underwood as U.S. President Elias Martinez; Sophia Maguire as the leader of a mysterious group of detainees; and Scott Patterson as Leila's shadowy father. Their futures are on a collision course in a global conspiracy that could ultimately change the fate of mankind. The network canceled the series after just one season.